With so many people now active on digital media, digital media marketing trend has become an important aspect of running one’s business. Business owners cannot just rely on traditional marketing techniques to foster growth of their business. Digital media is an easy way to appeal to customers in an innovative way providing them a showcase of your business before they choose you for their services. Though for a business owner it is difficult to maintain a check on all the digital marketing campaign going on and so a tool to lessen the burden is required. 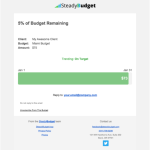 SteadyBudget is a tool that takes note of your digital marketing campaign with an eye on your budget to ensure you don’t run out of resources. The dashboard provides a smart way to manage your digital marketing campaigns. 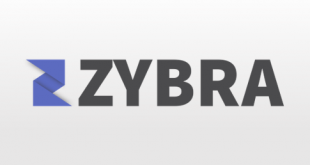 With the option of adding datasources and integrating clients all at one place. The interface is simple to interact and the tasks are easy to learn. 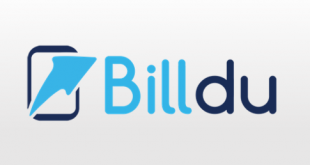 This tool lets you integrate datasources from Adwords, Bing and Facebook. Once the tool has been synced with these, any campaign that is added on these platforms is automatically picked up by SteadyBudget. This option lets you create, update or remove contacts from budget alerts. When the budget reaches a specified limit an automatic email is sent to these recipients informing them of the remaining budget amount. This option lets you add a client to this system and asks for name and currency. Budgets can be created for each client. This option lets you create a budget with the specification of amount that must lie inside your paid plan limit. User can set when the monthly budget starts and if it is not a monthly budget, user can specify other options for it. 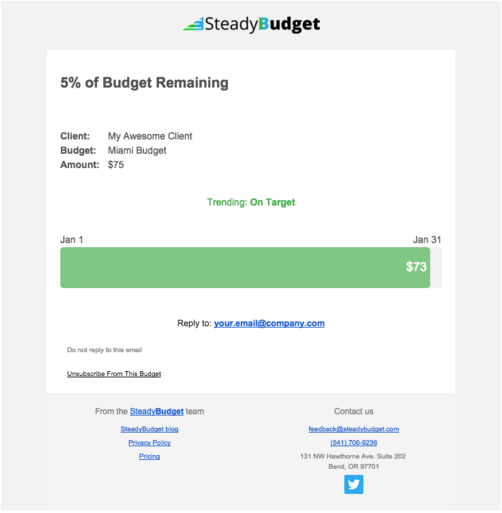 You can also set percentage as to when the system must send email alert of remaining budget. 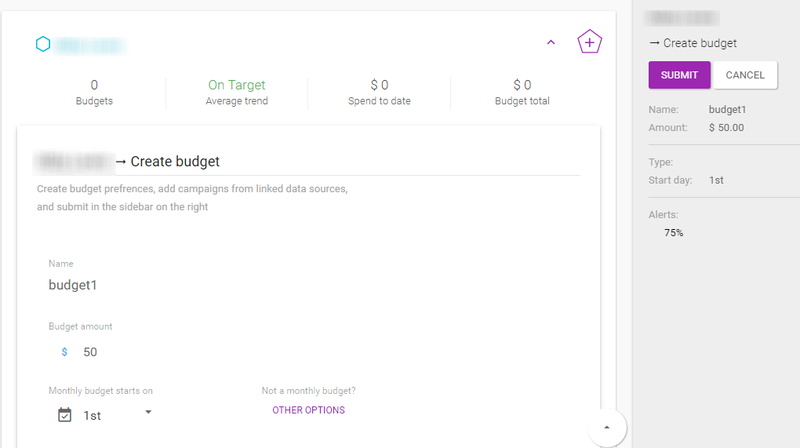 It is a quick way to view your clients and budgets in respect to current digital media campaign. It informs you about the amount that has been spent and the current trends. User can apply filters to refine the results and facility is available to export the information as well. User can also view alerts in a side tab to view the updates of the system and on the campaigns. Sends email alerts when reaching a limit of budget amount. Customization option for budgets if it is not a monthly budget. Supervise multiple campaigns at a single moment. 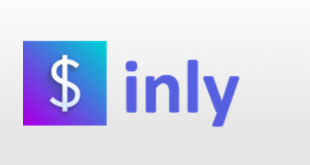 Allows integration with only Adwords, Bing and Facebook. It is often very difficult to keep a check on the amount being consumed in various digital media campaign since there are many platforms involved. This tool is perfect to resolve this concern as it maintains a check on how budget is spent and sends alerts when reaching exhaustion. Adding clients and creating budgets is very easy. 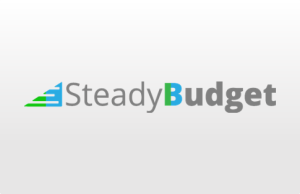 For more details, please visit: SteadyBudget webiste.